There are a couple of ways to create a Read More link in your email campaigns. You can link to the campaign page for your sent campaign, and use conditional merge tags to display the additional content. To add multiple Read More links to your campaign, use anchor links. In this article, we walk you through two different ways to add a single Read More link to your campaign. When you use a single Read More link in your Mailchimp campaign, you limit the amount of content visible in subscriber's inbox using conditional merge tags. When a subscriber clicks the Read More link, they're directed to the campaign page for your sent campaign where they can view your content in full. In this example, you’ll learn how to add a Read More link in a Text content block. 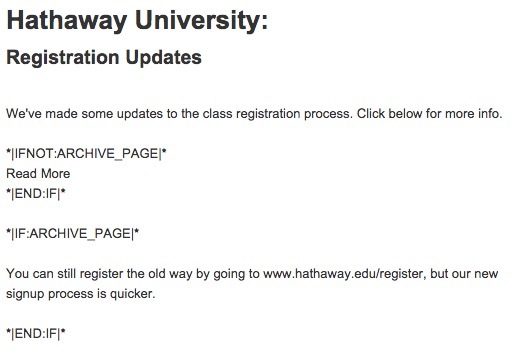 To link to your email campaign using conditional merge tags, follow these steps. Click Edit next to the email campaign you want to work with. 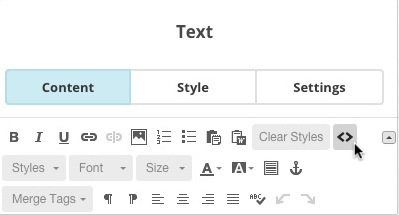 On the Design step, click a Text content block to edit it. Type or paste the introduction, or teaser, paragraph you want to appear in your email. Click the Paste as Plain Text icon in the toolbar. In the pop-up modal, paste in the copied code and click OK. Highlight the Read More text in the editor and click the Link icon in the toolbar. Type or paste the *|ARCHIVE|* merge tag into the Web Address (URL) box. 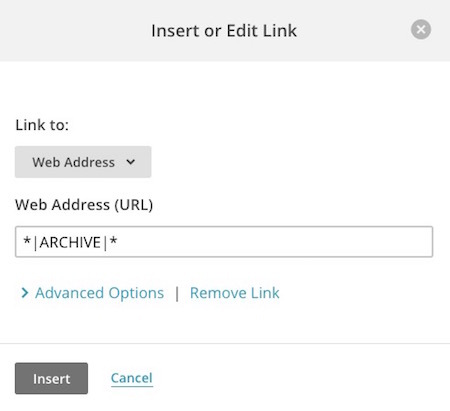 Add the *|IF:ARCHIVE_PAGE|* merge tag just before the content that your subscribers will see after they click the Read More link. Once you're finished adding the content, add the *|END:IF|* merge tag after the content to close the conditional statement. Always preview and test your email campaign before you send. If you're more comfortable working with the underlying code of a Mailchimp campaign, you can add the Read More link directly in the HTML. To link to your email campaign from your source code, follow these steps. Click Edit next to the email you want to work with. Type or paste the introduction, or teaser, paragraph that you want to appear in your email. Click the Source < > button in the toolbar. Paste the following code into the source, where the Read More link should appear. Click the < > button to return to the visual editor. If you have more than one article in your campaign and you'd like to show just a teaser in subscribers' inboxes, add multiple Read More links using anchor links. On the Design step, click the Pencil icon for the text block you want to add the read more link to. At the end of your content, click the Anchor button in the Editor toolbar to add the anchor. 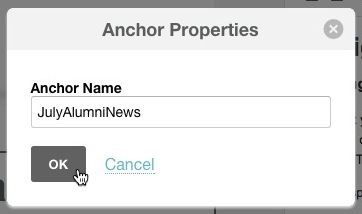 Name the anchor in the Anchor Properties box and click OK. In order to function properly, anchor names can't include any spaces or special characters. Make sure to give the anchor link for each content section a unique name so subscribers aren't accidentally sent to the same place in the campaign. Set up your Read More text by adding this code to your content. Highlight the Read More link and click on the Link icon on the toolbar. 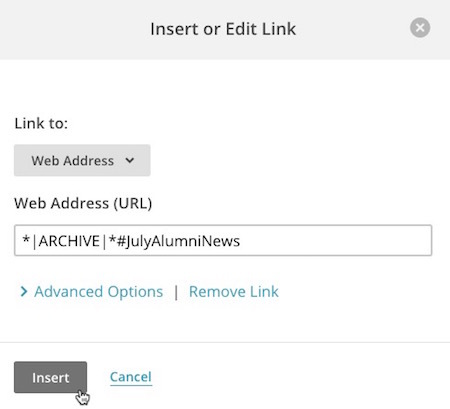 In the Insert / Edit Link box, type the archive merge tag, a # sign, and the name you gave your anchor. Click Insert to create the link. Add the *|IF:ARCHIVE_PAGE|* merge tag before the content that your subscribers will see after they click the Read More link. Add the *|END:IF|* merge tag after the content to close the conditional statement. Repeat these steps for every article you want to have a Read More link. Always preview and test your campaign before you send to your subscribers. Links that are made up entirely of merge tags, like Read More links, can't be tracked for campaign reports. Conditional merge tags display content based on subscriber data. Learn how to use these merge tags in your emails, or troubleshoot them.